Vast Multisite networks like WordPress.com and Edublogs help their users to find great new content and communicate with each other by linking them up as a community. There are a few options you have for this, which will depend on the nature of your network and the needs of your users. Some of these can be added as your network grows while others will need to be set up from the start. This is the fifth post in our six-part WordPress Multisite masterclass series. In this series, you’ll learn everything you need to know to create your own network, add sites to it or let users add their own, and manage the network. You’ll learn how to ensure your network is secure and high performing and how to create a successful community of users and sites. Creating a social network on your main site with the option for users to create their own blogs. Letting users view each other’s content in their dashboard and display their favorite content from around the network on their own site. Displaying the latest or featured content from around the network (including posts and comments) on your main site, encouraging visitors to browse other sites in your network. Displaying the latest or featured content from around the network on other sites in the network. Letting your users connect directly with each other by making friends via their dashboard. It’s unlikely you’ll want to do all this, so it makes sense to put some time into planning your community first and identifying what your users need and what you’ll need to provide. The two largest Multisite networks in the world are also communities of users and readers. Both WordPress.com and Edublogs encourage users to follow each other and consume each others’ content. In this tutorial, I’ll show you how to use some of WPMU DEV’s plugins that power Edublogs’ community features so you can set up a community of your own. Will user interaction be on the main site, or via the dashboard of their own sites? Will users need to create events, groups etc. to support community activity? Will users want to easily access each others’ site content? Will users want to share each others’ content? Will users need to have social interactions involving posts, comments, and discussions? What content will you display or share on your main site? How much will be public and how much private to users of the network? The answers to these questions will determine the extent to which your network comes under one or more of three headings: social interactions, consuming content, and sharing content. You’ll probably have one of these as your main focus, maybe with one or two others as secondary areas. A network whose primary aim is to enable the creation of blogs (like Edublogs or WordPress.com) will focus on that, and add the sharing of content created in those blogs and any social aspects as a feature in the front-end and backend. A site focused on creating a social community will focus on making that work well on the main site, with the added extra of letting users create their own site. BuddyPress might be the most important component of a site like this. If you want to let potential users sample the content created in your network, you’ll focus on plugins that let you share content from around the network on the front end of your site, so the public can read it. Let’s look at each of these aspects in detail. Edublogs and WordPress.com both let their users see the latest content from around the network in their dashboard. This means that every time a user logs in, they get to see what other people have been posting. This encourages people to browse the network and consume content as well as to post new content themselves in the hope that others will follow them. 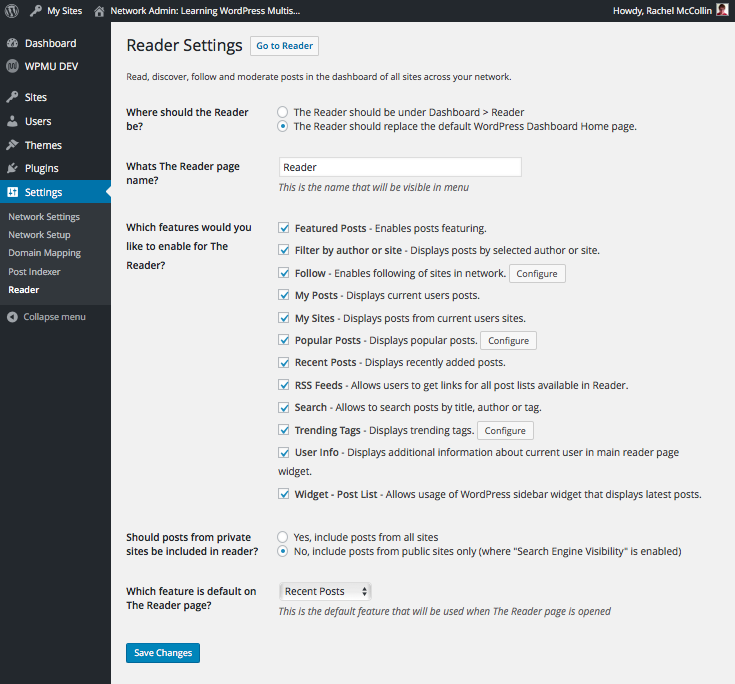 Let’s take a look at how you can set this up on your network using the Reader plugin. Before installing any of our plugins for sharing and consuming content across your network, you’ll need to install and network activate the Post Indexer plugin. This is necessary for plugins such as Reader, Recent Global Posts and Recent Global Comments (which we’ll look at shortly) to work. Install the Post Indexer plugin using the WPMU DEV dashboard in your site. Make sure it’s network activated. You don’t need to do any configuration of this plugin, it will automatically work for you. Next, install and activate the Reader plugin via the WPMU DEV dashboard and network activate it. Here you can specify how the Reader will work for your users. In the first section, Where should the Reader be?, select The Reader should replace the default WordPress Dashboard Home page. Then select those aspects of the Reader you want to enable from the list beneath. You should already be following your own site by default. Recent posts from that site will be displayed. If nothing is showing up yet, create some posts! Users of your network, whether they’re site admins or not, can follow other sites on the network. The content from those sites will then appear on the dashboard. You can then view those posts by clicking on them or follow the blogs they’re on by clicking the Follow button below each post in the search results screen. Users can also find sites to follow if you share featured or latest content on your main site. They simply click through to the content, then click the Follow icon in the admin bar when viewing the site. You’ll learn how to share content on your main site in the next section. Share content that you’re following via the Reader, using the widget provided by the Reader plugin. Use a shortcode to share posts on a page in your main site, with the Recent Global Posts plugin. Use a widget to share posts in your sidebar or footer, with the Recent Global Posts Widget plugin. Add a comments widget to your sidebar or footer with the Recent Comments Widget plugin. Use the Live Stream Widget plugin to display a live stream of latest content from your network in any widget area. How to create a page in your main site that showcases recent content. How to add recent content to widget areas in a site in your network. If you haven’t already done so, install and network activate the Post Indexer plugin – see instructions in the previous section. So let’s set one up on the main site in our network. To do this, you’ll need the Recent Global Posts plugin installed and activated. Type in some content to entice visitors and tell them what them the page is about. Then type in [globalrecentposts]. This is a shortcode – the plugin will use it to populate the page with the most recent posts from around your network. Note: The eagle-eyed among you will notice that I’ve added a login widget to the sidebar of my main site. This gives users an easy way to login if they can’t remember how to access their login page. I used the Login Widget with Shortcode plugin to do this. title_characters=”250″: Maximum number of characters in each title. title_content_divider=”-“: What to use to separate the title from the content. If this parameter is not included, the content will display beneath the title. title_link=”no”: By default, the title links to the post. You can use this to remove the link. show_avatars=”yes”: Displays the author avatar if avatars are used on your site. avatar_size=”32″: Sets the square size of the avatars. posttype=”post-type”: Use to specify the post type to display. Default is “post”. Note that you can only specify one post-type. The values in the examples above are just that: examples. You provide your own values. In this case I want to add avatars and an excerpt of the post. To do this, replace [globalrecentposts] with [globalrecentposts content_characters=”250″ show_avatars=”yes” avatar_size=”40″ ]. That looks a bit more enticing! Now let’s add a link to encourage people to sign up. Add some text below your recent posts shortcode, inside a link to the sign up page at wp-signup.php, that you created in Part 3 of this course. As well as that, add a link to this Latest Content page to your main navigation. If you want to entice readers in even more effectively, I’d advise using some styling in your theme to make that signup link more prominent and maybe to make the posts stand out from each other a bit more, as well as removing the bullet points. But that’s outside of the scope of this course so I’ll leave it to you! If you’ve installed the Reader plugin, your site admins can add its widget to their site to show people what they’re following around the network. You can do this via the Widgets screen or the Customizer. Let’s use the Customizer. Click the Add a Widget button and then select the Reader: Recent Posts widget. Fill out the Title field, select how many posts you want to display and the other options for display, such as post date, excerpt, and author. You can also use the widget to show the latest content from around the network or your own posts, so you might want to use it multiple times in one or more widget areas. Creating a community on your network is also about adding elements of social interaction. If you need your main site to function as a full-blown social network, you can install BuddyPress, but if you don’t need all of the functionality of BuddyPress, you can use the Friends plugin to allow members to make connections and the Messaging plugin to let them send each other messages. You’ll also find it helps your users if you let them upload their own avatar without using Gravatar. To do this, you can use the WP User Avatar plugin. Most people don’t have an account on Gravatar and your users may not want to set one up. So you can install the WP User Avatar plugin to let your users add their own profile picture from their Profile screen. Install the plugin on your network (from the plugin directory) and network activate it in the normal way. To let your users connect with each other, install the Friends plugin via the WPMU DEV dashboard and network activate it. If you want to let them send each other messages too, install the Messaging plugin and network activate that too. Make any changes you want to, then click the Save Changes button. You’ll need to click Save Changes for each of the their templates, not just once on the screen. Then click the Add link next to their image. You can check out their site first by clicking the View Blog link, approve the friend request or reject it. The person sending the request will get an email to let them know your response. Just type in the message, click Send and the other user will get an email notifying them. You can use all of the same formatting options for your message as you would in a post. You can also send messages from this section of the admin menu, as well as from the friends screens. Adding community features to your Multisite network gives your users something more than just a way to create sites. They can also consume their favorite content, share it with others and connect directly with other users. You can also use community features to showcase what’s going on around your network in the main site and demonstrate why your network is so great. Creating a community makes the network that much more valuable for your users and will help them get more from it.